Molly Wizenberg has a recipe called "The Winning Hearts and Minds Cake, or Our Wedding Cake" in the last chapter of her book, "A Homemade Life." Obviously her book ends with her wedding. I won't ruin it for you but Wizenberg has a great "it only happens in the movies" story on how she met her husband. I was looking for a chocolate cake recipe to make for someone's birthday. I did a "test" cake and brought it to the office and the general consensus was that it was good, very chocolaty and fudgy almost like a brownie. I was afraid it was too sweet but people (even those who don't generally like very sweet things) told me the sweetness was just right. Anyway, I decided not to make anything for the birthday after all. But you can try this delicious recipe if you love chocolate....or if you want to win some hearts and minds. Preheat oven to 375 degrees and butter an 8-inch round cake pan. Cut a piece of round parchment paper and line bottom of cake pan and butter the paper too. 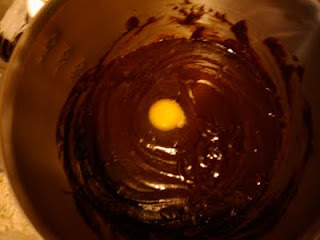 Put chocolate and butter in a medium bowl and microwave on 30 second intervals, stirring often, until smooth. You can also use a double boiler. 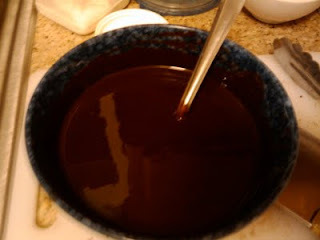 When chocolate mixture is smooth, add sugar and stir well to incorporate. You might have to switch to a large bowl before do this because there are more ingredients coming. Set batter aside to cool for 5 minutes. Then add the eggs one by one, stirring well after each addition. Add flour and stir well to mix. The batter should be dark and silky. 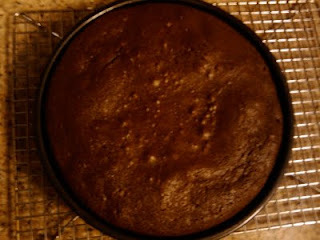 Pour batter into the cake pan and bake for 25 minutes, or until the top is crackly, edges are puffed and the cake center looks set (doesn't jiggle). Wizenberg suggests setting the timer to 20 minutes and then monitoring the cake at 2 minute intervals to avoid over-baking. The cake is done when the center only jiggles slightly. 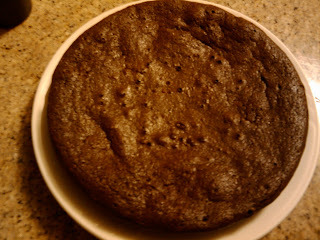 Remove cake from oven and leave it in the pan and cool on a cooling rack for 15 minutes. Then flip the cake onto a serving plate to finish cooling. The cake is very delicate so this is Wizenberg's tip. 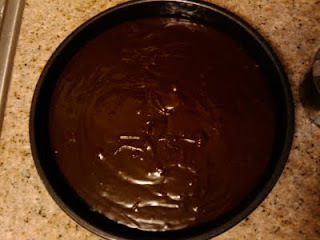 Place a sheet of aluminum foil over the cake pan and place a large, flat plate/sheet plate - not the serving plate - on top of the foil, facing down. Hold cake pan and plate firmly together and quickly/carefully flip them. Remove cake pan to reveal cake which is now upside-down. Remove parchment paper. Gently place the serving plate on top of the cake. Wedge your index fingers between the plates to keep from squishing the cake, flip them so the cake is now right side up. Remove foil. You MUST cool completely before serving. In fact, Wizenberg recommend that you wrap the cake in plastic wrap, then foil, and freeze for at least a day or so and allow 24 hours for it to return to room temperature before serving. Freezing actually improves the texture and flavor of the cake. I agree with her. I taste-tested the cake when it was warm and it was too gooey. I refrigerated a small piece and freezing and then bringing back to room temperature was the best. 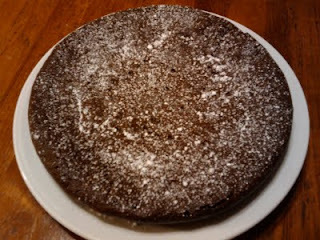 Instead of serving with whipped cream, I used a stainless-steel sieve and sifted powdered sugar on top of the cake. 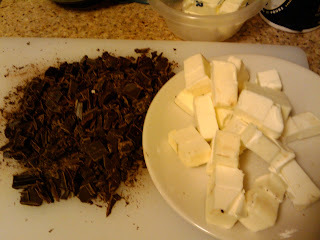 Finely chopped chocolate and cubed butter. Silky melted chocolate and butter. Mmmmmm. Adding eggs one at a time and then add the flour last. Silky batter poured into the prepared pan. Cake done after 24 minutes. It was pretty puffed up coming out of the oven but it quickly de-puffed while cooling on the rack. Flipped the cake onto a serving pan. No problem. Great tip from Wizenberg. 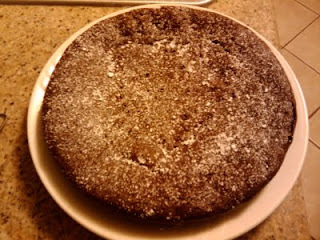 After cooling, I dusted powdered sugar to finish. A friend suggested pairing the cake with a raspberry or some type of fruit sauce which sounds delicious too. I'm trying a new format to post recipes and photos. Hope this works better for folks who are trying to print and/or follow the recipe. Okay, go win some hearts and minds now!